Predictions in Ungauged Basins (PUB) is an IAHS initiative operating throughout the decade of 2003-2012, established with the primary aim of reducing uncertainty in hydrological predictions. It is a ‘grass-roots’ science movement intended to engage the interest of hydrologists around the world, and has grown to encompass an enormous variety of approaches and settings. You can read about the full scope of PUB activities on the web site. One of the major current activities is the publication of a synthesis report that summarises and interprets the state of the art in hydrological prediction for ungauged basins. For places with no streamflow measurements, how good are our estimates of streamflow quantities such as the mean flow, the seasonal pattern of flow rates, the frequency of different flow rates (aka the flow duration curve), flood frequency, low flow frequency, and indeed the entire time series of flow rates? Which methods provide the most reliable estimates? How is this affected by climate, catchment size, and other factors that describe the physical setting? To answer these questions, the book synthesises hundreds of studies from around the world, pulled together by a team of more than 50 authors. The book includes chapters for each of the streamflow quantities I listed above, and I’m involved as the editor for one chapter. Here I’ll try to give you the flavour of the book, using just a couple of examples. Suppose we want to estimate the long-term mean flow of a river, for which there are no streamflow measurements. 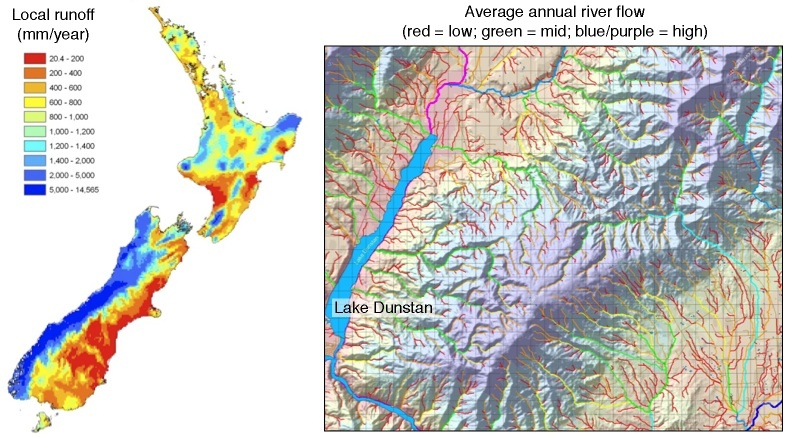 For streams anywhere in New Zealand, we have developed a simple method to predict mean streamflow rate, using maps of rainfall and potential evaporation, and a digital river network. This method produces estimates which are within +/- 25% of the true value for 95% of New Zealand. The estimates aren’t biased (just as likely to overestimate as underestimate), and errors are usually much smaller than +/- 25%. If you want to try it out for yourself, the estimates for anywhere in New Zealand are available on the web. Although we still have quite a bit to learn about New Zealand hydrology, I’ve also done some work at the global scale, using some theory I published a few years ago. Working at the global scale introduces a large number of new interesting science challenges, which I will have to gloss over here, for reasons of space. 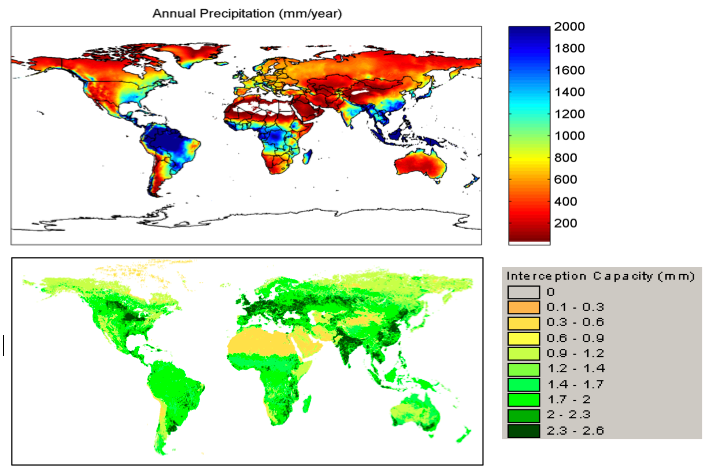 Once again, I’m using maps of rainfall and potential evaporation, as well as maps of the seasonality of climate, the type of land cover, and the infiltration and storage properties of the soil. This time the coverage is global, and New Zealand is barely visible! Here are just a couple of them, for average annual rainfall and the water holding capacity of the plant canopy. I’d be interested in hearing about some of the extremes- what point on earth do you think has the most runoff? Where is it the driest? Thanks for the question. The places with the highest average annual runoff are places with the highest average annual rainfall. So that will include places like Lloro in Colombia, Cherrapunji in India, Mt. Waialeale in Hawaii, and the headwaters of the Hokitika River in New Zealand. The global rainfall data set I am using is too coarse to pick up these fairly localised extremes. Although evaporation affects runoff too, it varies over a much smaller range of values than does rainfall. There are quite a few places which are tied for the lowest runoff, which is no runoff at all. Those places include the Dry Valleys in Antarctica, the Atacama Desert in Chile, where virtually no precipitation has been recorded. As far as I know, the driest parts of New Zealand are near Alexandra in Central Otago. This is such an interesting question that it really deserves a post of its own.